Reynolds is piloting a new workforce program providing Certified Nurse Aide (CNA) training for participants as they earn a GED®. PluggedInVA (PIVA) is a statewide workforce program focusing on GED® preparation combined with skill development leading to industry-recognized credentials. With a strong track record in other localities, Reynolds’ Middle College and the Capital Region’s Adult Education programs partnered to launch the PIVA project model in the Richmond area. While the pilot will launch with CNA instruction, using the PIVA model allows Reynolds to expand to other career studies programs. After completing the GED, PIVA students would then matriculate into Reynolds credit courses focusing on Personal Care Assistant, Certified Nurse Aide and other healthcare related classes. Reynolds is exploring additional industries, such as welding, manufacturing, and logistics, for future PIVA programs. Adult Education is a key partner, providing classroom instruction and outreach to the communities of Region 15. Classes are held at Reynolds’ Downtown Campus, which is the site of the college’s School of Nursing and Allied Health. “This is a college and career pathway initiative, because it positions students to continue their training in healthcare while gaining practical experience and a paycheck as a CNA. Middle College has always been focused on GED attainment as an important first step to post-secondary education, but it shouldn’t be the last,” Washko said. J. Sargeant Reynolds Community College is expanding its culinary arts program in a move that, if successful, will create a much-needed pipeline of trained kitchen workers for Richmond’s booming restaurant scene. 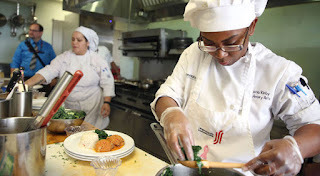 The Culinary Institute at Reynolds, as it will be known, also will help boost a development that already plans to house a grocery store serving Richmond’s Church Hill North neighborhood, a food desert in the city’s East End. On October 1, Richmond National Battlefield Parks hosted its first ever bioblitz, a nationwide event in which volunteers become citizen scientists and help catalogue as much of their local biodiversity as they can. Volunteers also include numerous professors and students from University of Richmond and Virginia Commonwealth University. Professors incorporated this experience into their curricula to give students a better appreciation of how much there is living in one’s local environment and give students a taste of conducting real scientific research. Richard Groover from Reynolds also led a team for this research. 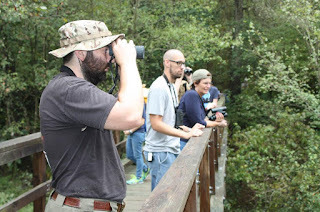 Using the smartphone app iNaturalist, with which anyone can document and make accessible local wildlife observations, volunteers were able to document 226 unique species living at our Totopotomoy Creek site, on October 1st. Assistant dean and biology professor Richard Groover has been surveying for the last 6 months all possible insect species found at Totopotomoy Creek Battlefield. At the National Park Service’s request, he will continue to survey insect species at three more battlefield over the coming years.